Mala Hot Pot | Get Your Grub On! If it’s too hot, you are too weak! I first tried this awesome dish when visiting a good friend in Beijing last year where she brought us to a restaurant that fries you up any ingredient you can think of in a spicy chili gravy. Today again I had different plans for lunch initially as I wanted to bring an old uni friend who came over for a visit for Xiao Long Bao and Sichuan Noodles but didn’t know that Chinatown Complex is currently under renovation. Thinking of a fast solution to our problem I remembered friends mentioning that they found a shop which offers the ‘Mala Hot Pot‘ in a Yong Tau Fu style at People’s Park Food Center right across the street. 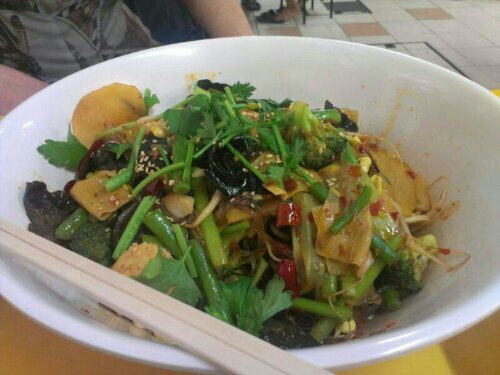 We were really hungry so we went for a big bowl of the medium spicy version with lots of vegetables, glass noodles, potato, tofu and beancurd skin (10$). It came out of the kitchen piping hot and smelled wonderful. We got our grub on and it was exactly as I remembered it from China. The ingredients were all fresh and not overcooked, all covered with a glaze of their biting chili gravy with enough Sichuan peppers to numb your entire pie hole. It started quite harmless but the more we worked our way down where the ingredients soaked in the gravy it slowly started burning holes into my stomach. Let’s just say we were happy we went for medium. Oh and the noodles, loved the noodles, next time I have to ask for a double portion. This place is great and as ‘Dry Pot‘ is not yet so commonly available in Singapore I will pay them a visit from time to time when I need to spice things up.